I used CMS Made Simple and it does what the name promises: It’s easy to set up and if you have a basic understanding of databases providing dynamic content, then you should be up and running quite quickly. 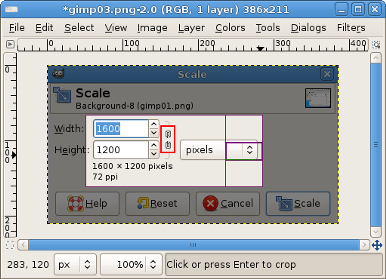 GIMP (short for GNU Image Manipulation Program – http://www.gimp.org) is a great tool – it’s versatile, it’s free and if you know it inside out, you swear by it. If you don’t know it very well, you just swear. Believe me, I’ve been there. Working as a sysadmin, including screenshots with a couple of 1) and 2) added results in a much better description of anything than stringing “Window 1” and submenu 47b together a hundred times. Although it sounds perfectly simple, you have to figure out how to do things in GIMP which can be nerv-wracking because much of it is counterintuitive if you don’t understand the how and why. And if you don’t keep using GIMP, you quickly forget about it all and you have to start all over again. Of course, there are tutorials about the GIMP. Lots of them. Written by friendly people with gallant intentions. You might even find what you are looking for. Oh, and recently there have been photo-editing tutorials in magazines as well. But I’ve rarely had to remove red eyes from OS screenshots. In order to fight the forgetfulness that is mine I’ve decided to accumulate my meagre (and hard earned) knowledge on the matter that is GIMP. It’s not much but it’s proven useful to me and I hope it will be useful to you as well. 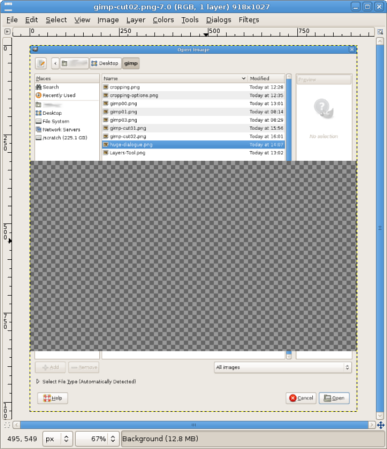 The GIMP’s native file format is .xcf but if you start with a screenshots, .png is fine and even .bmp will do. There’s no need to save the files in GIMP’s native file format or convert them. Resize windows before taking a screenshot! If you want to show users what options they have to pick from a menu or submenu, resize the program window as much as possible. Again, this will save you much work later. Resizing is straight forward. Open a screenshot, in the menu “Image” click “Scale Image…” OR press Shift+T which will bring up the same dialogue. HINT: Try to remember some of the basic key combinations, you’ll be much quicker!In the Scale dialouge, you can specify the new Width or Height in pixels, milimeters and other measurements. If the chain is symbol is disconnected as in the screenshot below, the screenshot will not be resized proportionally. You can use the Tab key to jump onto the chain symbol and connect by pressing Space. If you make a mistake, Ctrl+Z will take you one step back. The history in GIMP is not cut off by some memory restraint, so feel free to undo all steps if necessary. 1) The manual way: Using the Rectangle Select Tool, copy a part of a screenshot, open a new empty image, paste the selection and select “Autocrop Image” from the menu “Image”. This is all reliable and swell, but it’s quite slow. 2) The better way: Select the Crop Tool (Shift+C), select an area (which will be high-lighted) and press Enter. The high-lighted area will automatically preserved, the areas outside the selection will be discarded and the image will be auto-cropped. Fast and handy! 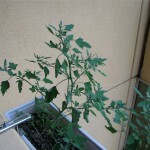 If the auto-crop does not happen, it’s just one click away. This option will allow you to move and resize the crop selection. Move the mouse cursor over the crop selection. Depending on where the cursor is, the cursor changes to reflect how you can pull or move the selection. As soon as the cursor changes, you can use the arrow keys on the keyboard to change the size or position of the selection. This is especially handy for me because I like using a trackball which makes it very difficult to do exact selections. HINT: To get an even better shot at the perfect selection, you can press “+” on the numberpad to zoom in (“-” to zoom out again) and move the selection within the range of pixels. They either make you wonder what this guys was thinking when the screenshot was made or what you were thinking when you made the screenshot if that guy happens to be you. If you think the screenshot is just fine, here’ s a hint: screen estate. See? If it’s your screenshot – retake it! If you don’t have access to the workstation where the screenshot was taken, you can also cut out part of the screenshot. Cutting out a part of a screenshot is slightly different to cropping. You will have to cut out the part in red, move the bottom part up so that it connects seamlessly to upper part, merge the layers and save the images. 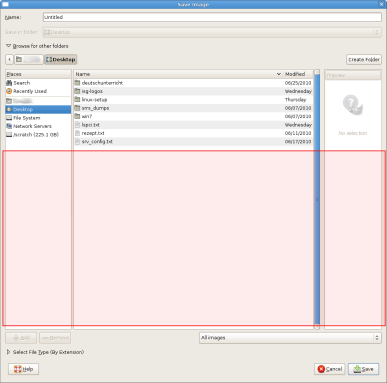 Your best friend is the Layers dialogue which you can find in the menu “Dialogs” -> Layers. Alternatively, press Ctrl+L to bring up that dialogue. Whenever you open a screenshot for editing, there will be one layer called “Background”. In the next step, you will have to move the lower part of the screenshot up to join the cuts. Maybe you noticed the how the lines of outline of the pasted image are running clockwise around the selection. This shows the selected layer. This has nothing to do with the Rectangle Select Tool. 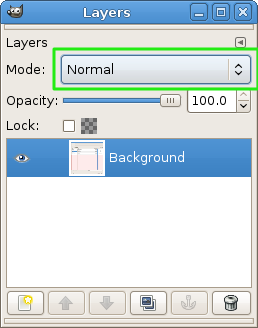 Also, it’s not possible to select a different layer in the Layers dialog. 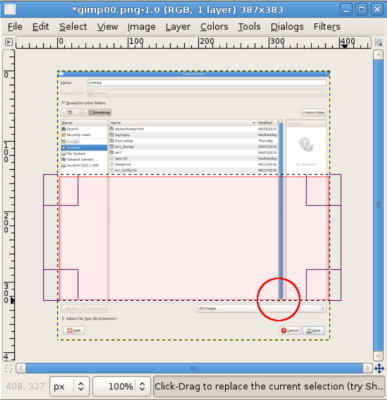 That’s why you have to right-click “Floating Selection (Pasted Layer)” in the Layers dialog and click “New Layer…”. 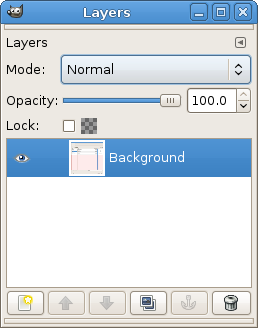 The layer’s name changes to “Pasted Layer”, the running line around the layer turns yellowish. Now it’s possible to select a different layer again. HINT: If you’re working on a more complicated image, you can rename “Pasted Layer” to anything you like such as Logo1 etc. This makes it easier to identify what the layer contains. If you’re just doing screenshots, I recommend to merge the layers now. Several layers are not supported in .png files anyway so you when you try to save the image, you will be prompted to flatten the image anyway. Right-click “Pasted Layer” and select “Merge Down”. Only the “Background” layer remains. 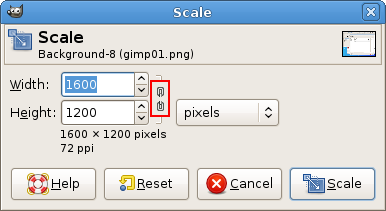 After another Autocrop (menu “Image” -> “Autocrop Image”) and another resize (menu “Image” -> “Scale image…” – remember to keep the width consistent across the screenshots if possible), the screenshot is ready for uploading. These tools always rely on some selection and thus have one drawback: It’s hard if not impossible to change some settings such as colors or line styles afterwards unless you use the Undo function in the menu “Edit” to get back to the point before you applied the color to the stroke selection. If you have changed several other things since then, these will also be undone. Use the Rectangle Select Tool or the Ellipse Select Tool to draw a selection around the button. If you want to fill the selection with a slightly opaque fill, the selection still has to be active. Use Undo if you have already selected something else or deselected everything. Click on the Bucket Fill Tool (Shift+B). -The Opacity slider defines how opaque the fill will be. -Use “Fill Type” to select what color or even what pattern the selection should be filled with. In this way, you can easily guide a user to complete a couple of configuration steps. HINT: If the configuration steps occur over a number of windows, try arranging on top of each other and you will get away with a single screenshot such as above. 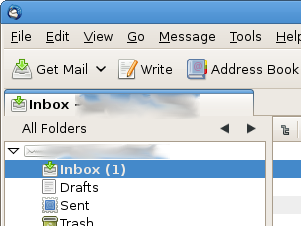 Although the option window is completely separate from the program window, by layering them you can keep everything nicely arranged. Occasionally, background images may interfere. 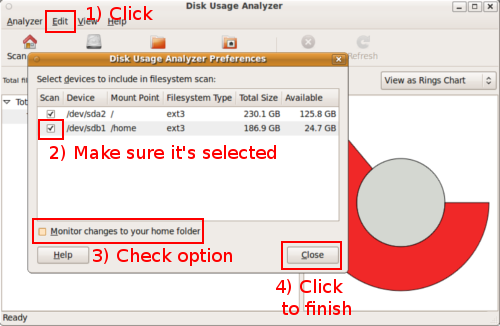 Originally I wanted to keep the text for 4) on one line but the disk usage in red behind the close button made this impossible. Then it is your turn to be creative. In this case, inserting a line break or changing the font colour are both valid options. While preparing the above screenshot, I noticed that it’s possible to resize the Text box by dragging the corners. 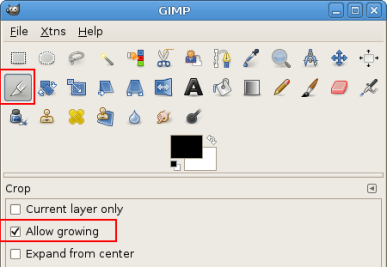 In older versions of the GIMP, that was not possible and the only way of changing a text box was to undo, undo, undo. This is definitely a useful improvement! Blurring text can be necessary if your screenshots contain sensitive information such as login names, host names, email adresses etc. Again, GIMP is a great tool – if you know how to use it. I’ve been tearing my hair out again and again over simple edits but I hope you will not have to suffer the same. If you have some additional tips, please let me know! 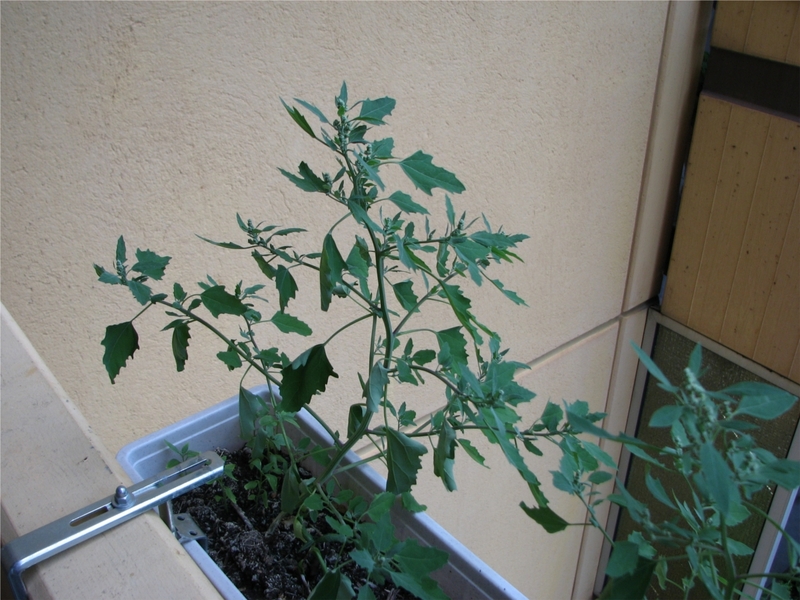 Seit es so warm ist, wächst bei mir auf dem Balkon diese Pflanze… Hat jemand eine Ahnung, um welche Pflanze es sich da handelt? Danke jedenfalls schon mal für ernsthafte Kommentare! You are currently browsing the Musings From Beyond blog archives for July, 2010.